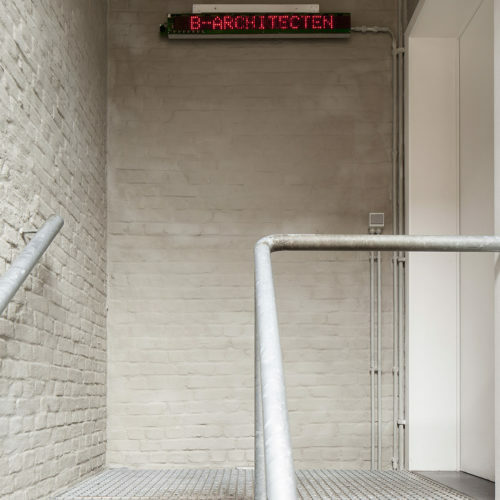 B-architecten & B-bis is a platform looking for surprising spatial solutions that target both the quality of life and sustainability. We at B & B-bis believe that every single person can make a difference in life. Our business is the developing and the designing of spatial solutions. But we do it with a passion aiming at a better society with the town as the main target. That is why B & B-bis is so much more than a mere building development agency. We offer a platform for talented designers who want to improve the quality of life and of living and who want to have an impact on the urban planning policies. 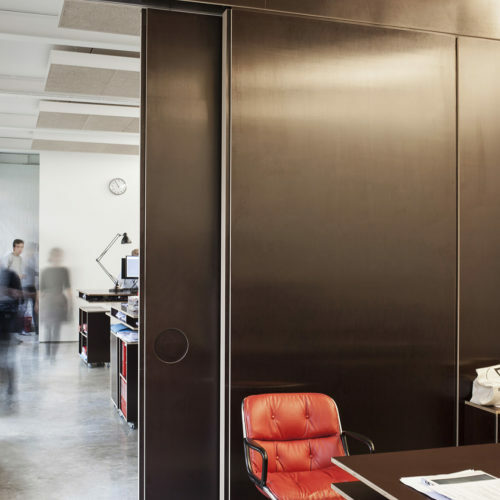 Our core business is design, ranging from a door handle to a city district. But we also invest in innovative research, we debate, we publish, we initiate our own ideas and we never stop pushing the boundaries of our profession. For us a better living environment can be achieved by urban densification. It will allow an optimized mix of emotional experience, concentration, sustainability, equality, quality, human scaled design and technology. To achieve this we trust the power of the platform and the clever alliances with complementary partners. For B & B-bis every project is an opportunity. We ask questions, we investigate and we try out. We dare to question the question, we add value to it and then allow the design to develop organically into a logical but often surprising solution. It makes all of our designs unique. The knowledge and the expertise that we have acquired serve as a source of inspiration for our new colleagues and other talented co-workers. We are dreaming pragmatics eager for tradition yet always respecting the future. 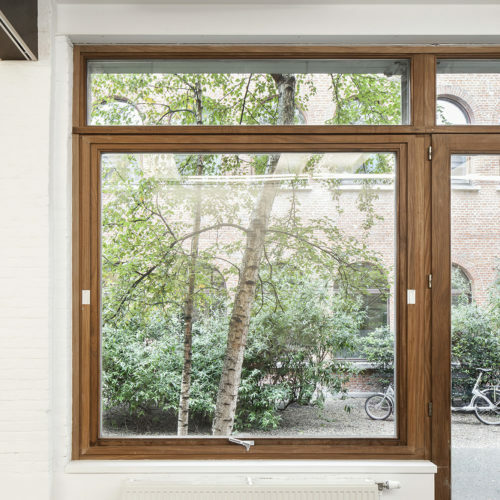 Back in 1997, Evert Crols, Dirk Engelen and Sven Grooten set up an independent office for architecture: B-architecten was born. They had met during their education in Antwerp and Amsterdam. At the international oriented Berlage Institute, it became clear that Evert, Dirk and Sven shared a common interest for design. 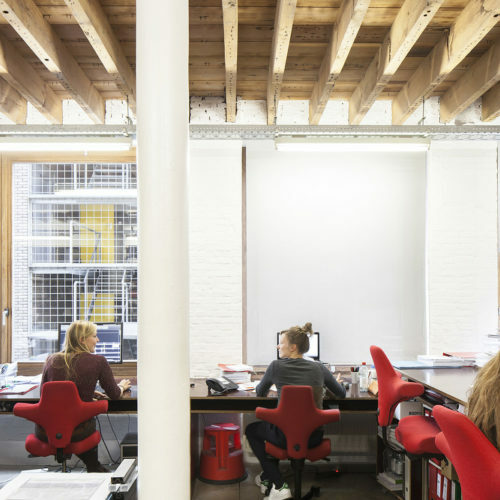 10 years after the foundation of B-architecten, they started a new initiative together with Sebastiaan Leroy: B-bis architecten, an office that focuses on smaller projects, interiors and furniture design. 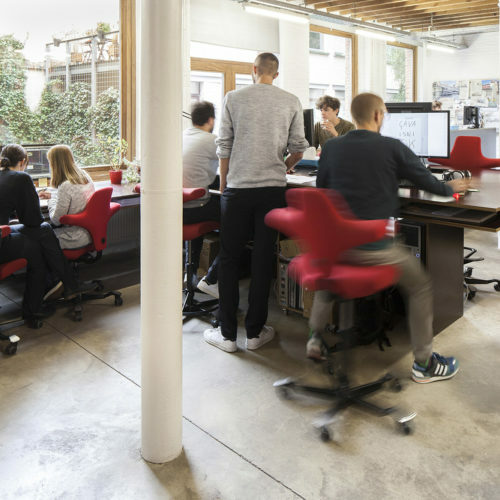 Since then, B-architecten & B-bis have grown naturally into a team of about 50 people who all share an innovative view on a variety of projects: housing, public buildings, schools, offices, urban design, interior and scenography.